If you were following me in 2013 you may remember a post I did called 101 in 1001 Days Challenge. 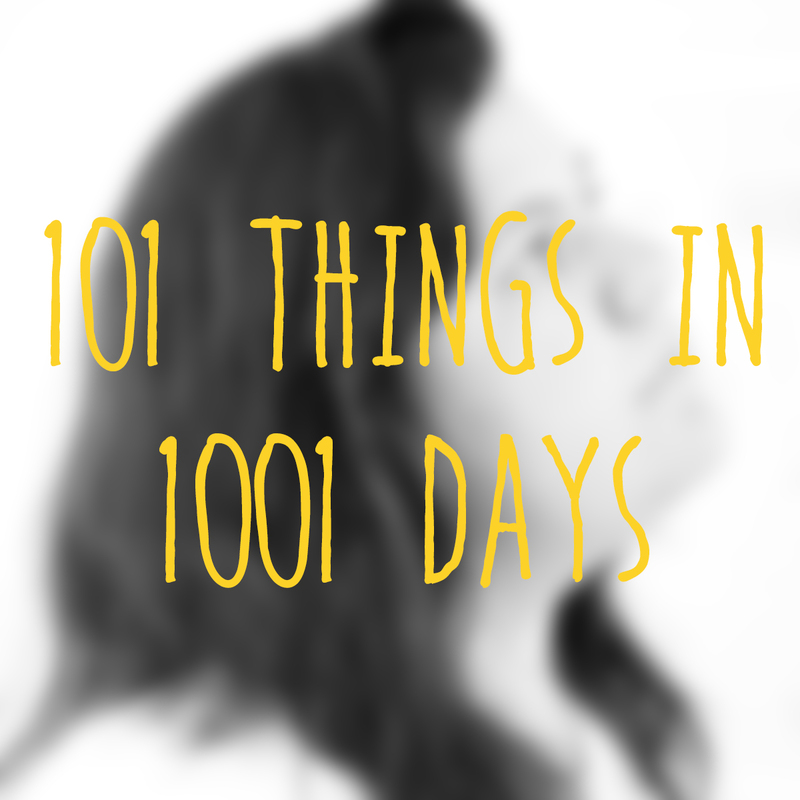 The idea is that you write a list of 101 things you want to do within 1001 days. I have removed my old post as I got a little embarrassed reading it - it's weird how much you can cringe just looking at something previous you wrote. However, I thought I would reboot it and see how I go this time around. I hope you'll join me. Go for a half-hour walk every day for a month. Cut soft drink from my diet. Go to Harry Potter world in Orlando. Grow my hair to the point where it reaches my bum. Dye my hair a fun colour. Join a new age/spiritual church or meet-up group. Donate half of my clothes. Donate monthly to a Quadriplegic charity. Finish scanning all my family photos. Gain 5 new pen pals. Go on a flying fox. Meet Harry Styles (I already have a cardboard cut out but it would be nice to meet the real him). Buy an ice cream maker. Send a postcard to a stranger. Finish reading all the Harry Potter books. Get an aura photo taken. Make my own wrapping paper. Complete three DIY projects from Pinterest. Post a video of my record collection. Create art with paint balloons like in The Princess Diaries. Go one week without using my phone. Participate in a colour run. Go one month without takeaway food. Complete 50 Questions That Will Free Your Mind. Paint my nails at least once a month. Make video and audio diaries. Visit a past life regressionist. Try making my own peanut butter. Send #TBT emails with photos every week for a year. Watch 10 classic Disney films. Buy Panic! At The Disco - A Fever You Can't Sweat Out vinyl. Learn how to change a tyre. Go sugarless for one month. Watch 10 old movies I've never seen before. Give a compliment every time I see a friend. Get a yearly pass to a theme park. Give 10 "just because" gifts. Make one person feel better about themselves. Hide a note inside a book in the library. Complete a photography challenge (92 Day Instax Challenge). Take a self portrait once a month. Fit into that blue and white dress. Make a growth chart with a piece of wood; document my friends & family members heights. Turn my diary entries and photographs into a book on blurb. Listen to every song in iTunes and clear out the ones I don't like. I am with you growing my hair SUPER long! My long hair and I have a love hate relationship. It takes so much time to make my hair look good and presentable. I wish you best of luck with your list. And I hope you enjoy your journey even if you don't accomplish everything in 1001 days. You've got a whole life ahead of you. P.S. Excuse my bad English. I'm not a native speaker. I've always been so close to fitting into it - it's just that the zipper at the back doesn't go all the way up! Thank you very much for your comment Anastasiia, your English is perfect! Make and upload 20 YouTube videos. and for all the right reasons, too. I say heck yeah to Youtube videos, and all these underestimated acts of love. If you're ever in Perth I'd love to show you around (though there's not much)! I love your list. I am currently scrambling to finish up mine (I have until sometime in 2016).